It is said that you realize the importance of something when it is gone. Its absence gives you an idea that you are incomplete without that thing. Speculation is rife that the third ODI at Ranchi was Dhoni's last international match at home soil. Maybe he wanted to end it on his home turf at Ranchi and therefore, decided not to play the next two games. However, no one in the world has ever been able to pick his brains and predict what exactly he will do. Dhoni has been in good form with the bat in 2019, scoring 327 runs in 8 innings at an average of 81.75. However, India is still in search of a back-up wicketkeeping option for the World Cup 2019. Since Dinesh Karthik has been dropped from the ODI squad, it seems that Pant is the front-runner for the wicket-keeping slot. However, Pant's keeping in the fourth ODI at Mohali showed that he has got a lot of work to do behind the stumps. He missed a couple of stumpings, his call to take the review against Ashton Turner was not successful, and he looked a bit erratic overall behind the stumps. Pant was still chattering a lot though. Perhaps he should focus more on working rather than chattering. It will be unfair on the young man to compare him with Dhoni, who has set sky-high standards in wicket-keeping. But Pant's basics also need improvement. As far as his batting is concerned, there is nothing much to judge. It was almost like the food had been cooked for him and he only had to serve it to himself. In fact, he got out with 5 overs to go; if he had batted through the innings, he could well have taken India to about 380. Dhoni was missed behind the stumps, but with the bat too. He has a tendency to hold one end up and then accelerate towards the end. That did not quite happen for India as they lost a flurry of wickets towards the end and fell at least 20 runs short of where they should have been after such a massive opening stand. A lot of people believe that Kuldeep Yadav, Yuzvendra Chahal and Kedar Jadhav were not as effective that night as they generally are, as Dhoni was not there to help them from behind the stumps. That may well have been the case, because he usually guides them very well. However, this may be a more sentimental argument. Maybe not Jadhav, but Chahal and Kuldeep have got enough experience now and they have become established bowlers. Dhoni's absence must not be an excuse for a bad day. It was during the middle stages and at the death when Dhoni was missed. His calming effect behind the stumps under pressure and the ability to make plans with the bowlers during the middle-stages could have been utilized effectively. It was a test of pro-activeness of Virat Kohli as a skipper, and he too looked under a lot of pressure. Kohli had to be on the boundary in the last 10 overs but there was no one to control the field inside the 30-yard circle. Maybe the decision to bat first was wrong, as the dew did not allow the bowlers to be effective. But credit has to go to Australia for batting very well under immense pressure; their players came up trumps when it mattered the most. This match would have told the Dhoni critics that he is invaluable to the team and his absence is missed as well. 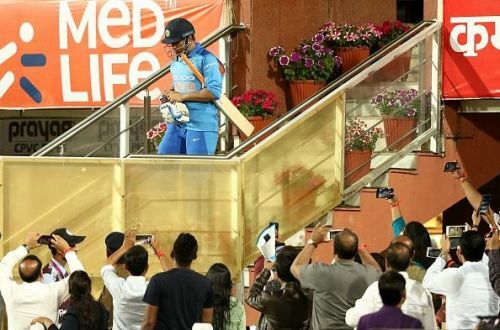 Even the crowd missed him as they chanted, "Dhoni, Dhoni" when Pant missed the stumping. Everyone loves Dhoni. So it would be good if the world just sat back and enjoyed whatever little is left of him, rather than criticize him about small things.